Gerhard's original design. 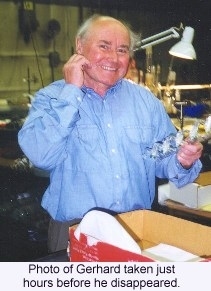 A founding member of Glass Music International (GMI), he was a central figure in all of the organization's events. Gerhard was a Master of what is known as European Flameworking. Often he could rotate and repair large, awkward apparatus on the bench without the aid of rollers, a stand, or even a blowhose! He was able to produce clean seals, precision tolerances, large sweeping bends and lifelike medical models with crude equipment and excellent speed. 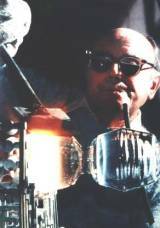 Over the span of his 36 years as President and Master Glassblower at G. Finkenbeiner Inc., Gerhard designed and fabricated complex Borosilicate and Quartz apparatus for virtually every University Chemistry, Physics, and Semiconductor lab in the Boston Area. His knowledge of application was extraordinary. He one of the first to employ torches made of Quartz to solve contamination problems. 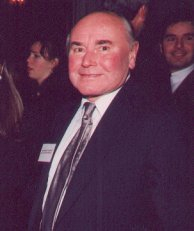 Gerhard is survived by three sons, Bertrand, Stephan and Pascal and many grandchildren. He is also mourned and dearly missed by his "work family" comprised of Thomas & Diane Hession, as well as former co workers Lisa Allen and Julie Malchow. As is so often the case, we appreciate those who are truly extraordinary only after they are gone. Gerhard was one of those people for whom there will never be an equal or replacement.